The Aquapac waterproof iPhone MP3 case offers guaranteed waterproof protection for all iPhone models. 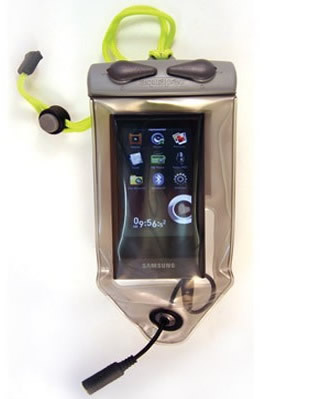 The Aquapac waterproof phone MP3 case has been professionally tested by the British Standards Institute. 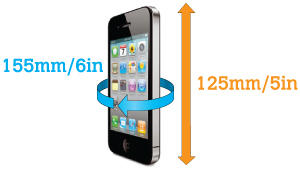 Aquapac waterproof iPhone cases have the markets lowest warranty return rate at 0.05% or 50 out of every 100,000 sold. Moreover Aquapac guarantee if the waterproof case fails they will compensate you for the contents as well as for the case and the warranty lasts for 5 years. "These are the most reliable cases we have sold in the past few years. No other manufacturer offers a 5 year warranty against defect. Aquapac simply offer the most reliable case to keep your iPhone waterproof." This MP3 case can be used with iPod's as well as the iPhone. The unit is generic sized MP3 case that allows the iPhone to fit in a snug yet functional manner. It allows for operation of the waterproof iPhone interface and the headphone jack allows access to sound. You can operate your waterproof iPhone right through the case. Designed with a built-in external waterproof headphone jack. The waterproof phone case will fit the majority of small and medium phones. It'll float with your iPhone in it. An Armband allowing you to strap the case to your arm or your equipment hence you can enjoy your activity hands-free. It comes with a packet of re-usable, re-indicating desiccant. These will help absorb any condensation in the air inside the case. The Aquapac 5 year global warranty against defective workmanship. It's softer and more malleable. Making it even easier to operate your iPhone controls through the material. The waterproof phone case will fits all iPhone models & the majority of small sized mobile phones. We recommend Overboard Headphones with this case as the best buy for quality of sound, comfort of fit and value for money.